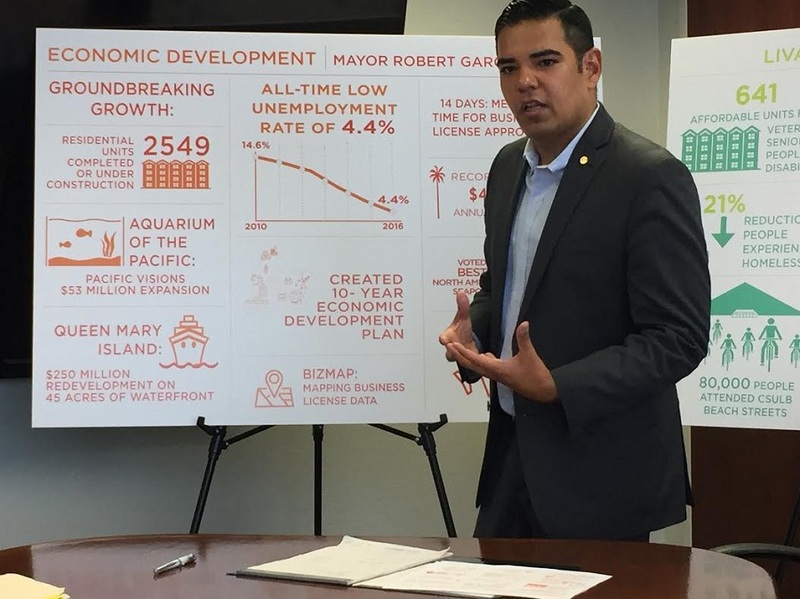 Mayor Robert Garcia talks about economic development during a press briefing Wednesday morning. Photo by Stephanie Rivera. Officially marking his third year in office Saturday, Mayor Robert Garcia took time this morning to meet with members of the media where he highlighted achievements made in the city, focusing on education, civic innovation, economic development and livability. The mayor said that over the last three years, the city has more than doubled the amount of paid internships offered to students. Through partnerships with the Long Beach Unified School District, Long Beach City College and Cal State Long Beach, the amount of internships soared from 1,500 to 4,100 internships today. The additional 2,600 internships surpasses Garcia’s goal set for the first four years in office, he said. 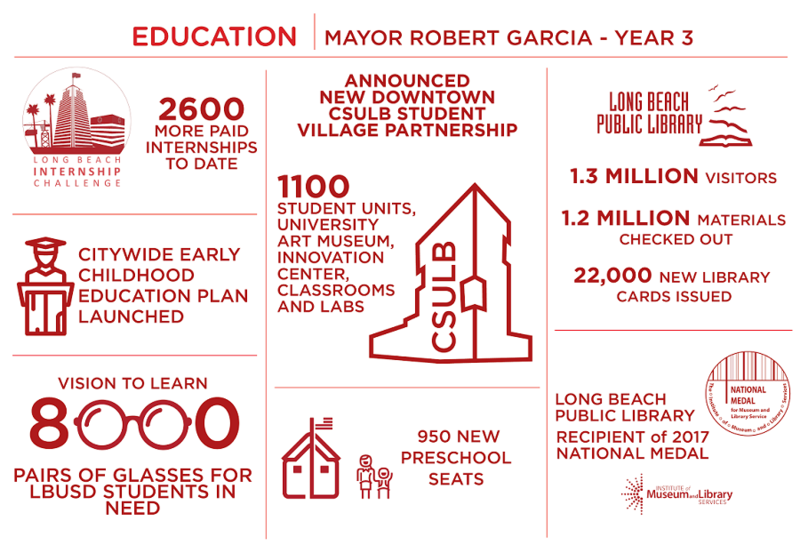 He detailed other achievements in education including an early childhood education plan launched by the city; the distribution of 8,000 pairs of glasses for LBUSD students in need; 950 new preschool seats; and the recent announcement of a new downtown CSULB Student Village which will provide student housing, an art museum, classrooms and labs. 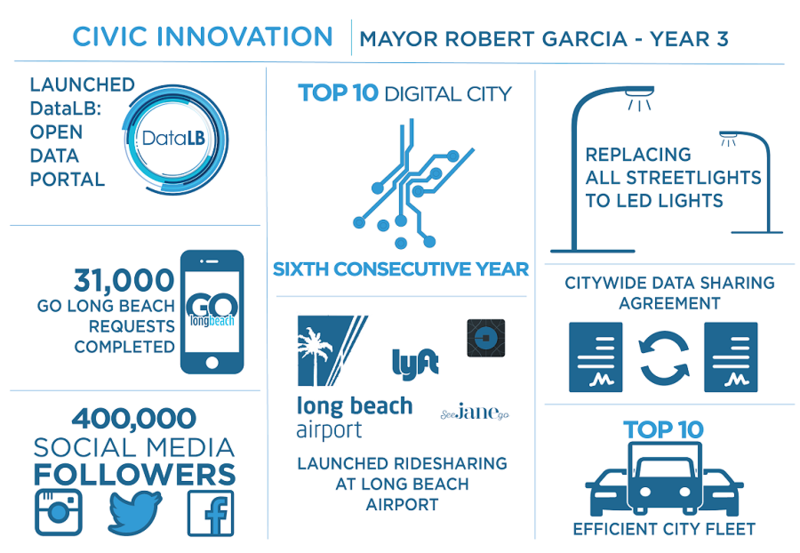 On civic innovation, Garcia highlighted the launch of the city’s open data portal, DataLB and the launch of a ridesharing partnership between the Long Beach Airport and companies like Uber and Lyft. Created in 2010 with Garcia’s help as a councilman, the Go Long Beach app this year received 31,000 requests that were completed by city staff for issues like broken sidewalks, weeds or trash pickup, according to Garcia. The mayor also pointed to an all-time low unemployment figure in the city which sits at 4.4 percent.He credited developers and new businesses for choosing to invest in the city. In June, Garcia revealed about 60 housing and business projects, at various stages of completion, taking place in the city, including housing developments completed or under construction that will result in 2,549 more residential units.The projects total about $3 billion in investment. 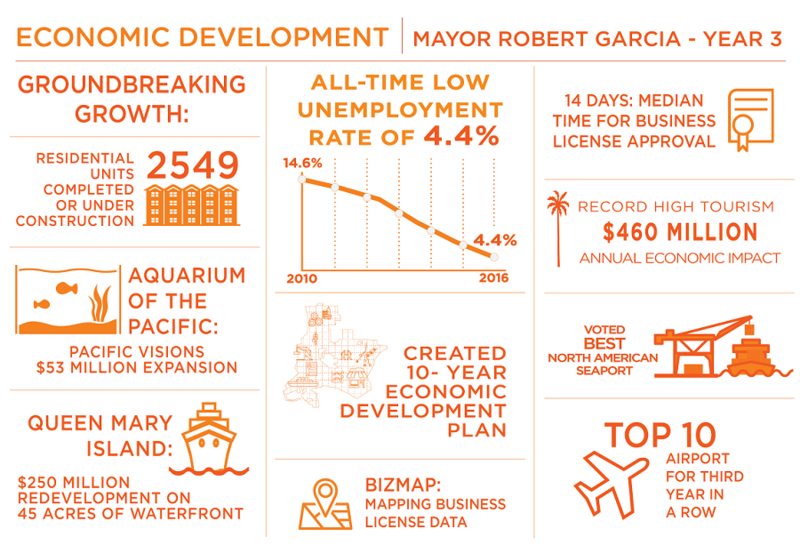 A record high rate of tourism has also contributed to the city’s economic development, according to Garcia, with the city seeing a record number of tourism dollars ($460 million) last year. Adding to the city’s economic development are efforts by the city’s staff and i-team to streamline business applications. The result, Garcia said, is a decrease by a full week in the time necessary to acquire a business license. While Long Beach has seen a decrease in homelessness, construction downtown has forced the homeless population out into other parts of the city, according to the most recent homeless count. However, Garcia noted that the recent passage of Measure H and the city’s efforts to add more affordable housing will help address these issues. But they won’t solve the issues completely. Garcia noted the challenges facing the city, including the dual challenges of housing and homelessness—an issue most cities in the state are also facing. That’s a recipe for a statewide crisis, Garcia added. While Long Beach is building affordable housing, Garcia admitted that the city must do a better job of building more still. The city has also begun to address other livability concerns through Measure A, a sales tax measure passed last year to address infrastructure needs throughout the city that went into effect this January. 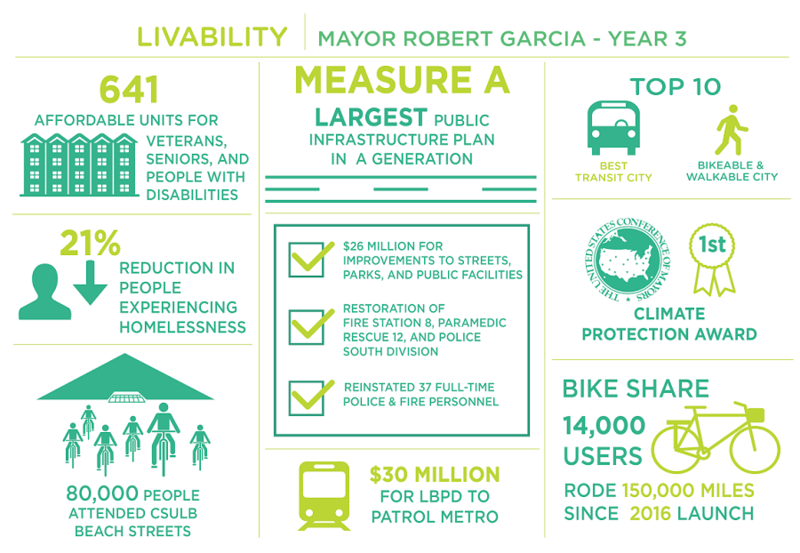 Garcia said Measure A has provided $26 million this year to begin the investment into infrastructure to rebuild streets, sidewalks, alleys and critical facilities. Measure A funds have allowed for the restoration of Fire Station 8, Paramedic Rescue 12 and the Long Beach Police Department’s South Division. It has also helped reinstate 37 full-time police and fire personnel. Garcia also noted the city’s efforts to continue to stay fiscally responsible and not overspend in light of the state projecting a deficit over the next couple of years.